Yes, even the ugly ones. Note to self: Set aside all money for 2010. Although the DS's showing at E3 was nowhere near as expansive as some of us would have liked, Nintendo still came out of it with a few nice treats lined up for us in the next twelve months. Well, today they got a little more specific with their timings, letting us know exactly when we can buy those mouthwatering new pocket titles - although sadly some dates are more exact than others. Bear in mind that these are all North American release dates, and that they are subject to change, within reason - don't expect to see Golden Sun DS bumped up to pre-Christmas. The good news of course is that Picross 3D is now on Nintendo of America's release schedule, a cheering thought for all of us dying to get our hands on the cubic mindbender, and it's nice to see the next Professor Layton game due out as early as August. That said, the fact we won't be playing Golden Sun DS until next year is... almost too much to bear. Will be a long wait for Golden Sun DS, but hopefully well worth it. Cant wait for Golden Sun DS. Been years since the last one. Hopefully this one will be just as good. DS Game I'm most looking forward to? The picture terrified me into thinking these were all calendar apps. Wario Ware DIY and Zelda are the ones I'm looking forward the most. For anyone considering Picross 3D I'd recommend you import it now. The language barrier is almost nonexistent (I know zero japanese and can play the game fine, even having submitted puzzles to the contest). Also, consider this: When Picross DS was released in Europe, Nintendo only released two puzzle packs online, even though there were at least 10 for the original. The japanese version of Picross 3D has already 13 packs of puzzles for download. How many will make it on the European version??? Can't wait for Inside Story and Spirit Tracks! I've never played a Golden Sun game though. Maybe this'll be my first! and what is that one game that is using sprites of brawl, for a ds game, is this a smash for a portable?????? Leonardo: Take the ugly one! Donatello: I'll take the ugly one. Michaelangelo: Which one's the ugly one? Professor Layton, Mario & Luigi, and Spirit Tracks will make 09 a worthwhile year in my opinion. Mario & Luigi!!!! Yeees! Spirit Tracks, Wario Ware DIY And Professor Layton 2 Will Come Into My Collection ;D ! Agree with caption, so much. Darn it! I was expecting Golden Sun to be bumped up to pre-Christmas...Just kidding. No matter how long this game takes, I will wait for it and buy it the day it comes out. I've been waiting six years already, I can wait a year or so more. I'm most excited for Professor Layton. It's coming soon AND I've been anticipating it. Also, what is Style Sawy? Style Savvy is yet another fashion/clothes design game for DS, except published by Nintendo. Can't wait to play that one. 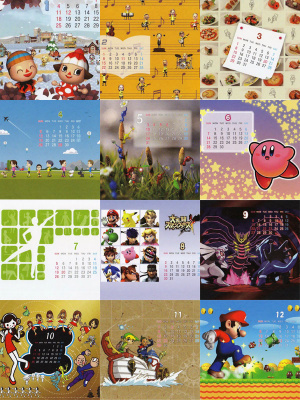 @zranoll - the story image is just the monthly pages from Nintendo's official wall calendar: it's not a representation of DS games due out this year. Come on, Mario & Luigi, I need your stereotyped expressions of awesomeness! I'm disappointed that I won't be playing Golden Sun until 2010 but I'll have Professor Layton, Mario and Luigi, Zelda: Spirit Tracks and Picross 3D to keep me happy! Oh, I've waited this long for a new Golden Sun, I can wait another year. I plan to pick up Layton 2, since I enjoyed the first one that I borrowed from a friend. w00t, Mario & Luigi 3! Professor Layton 2 on 8/24, followed by Final Fantasy Dissidia and Batman Arkham Asylum on 8/25. I'm sort of interested in Picross 3D, Fossil Fighters, Mario and Luigi, and Glory of Heracles. That is, if Glory of Heracles is an action RPG. Is it? Can anyone say DS is the best handheld and system around? "don't expect to see Golden Sun DS bumped up to pre-Christmas." That was completely uncalled for, sir. Ooh, ooh! I want me some Style Savvy! I'll be all over Mario&Luigi, Professor Layton, and Picross. WarioWare DIY looks interesting, but I'd have to read actual user impressions. where can i get that picture? or wallpapers? Nothing that interests me, sadly, except maybe M&L. Then you must not have read the words "Golden Sun" up there.